The San Marco Museum has a twofold identity. 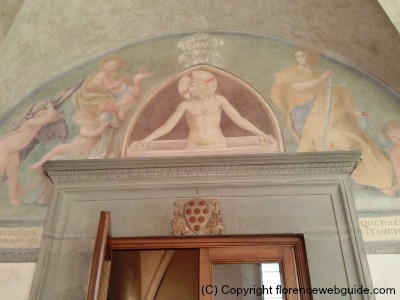 On one hand, it is a former monastery of profound significance in the history of Florence. 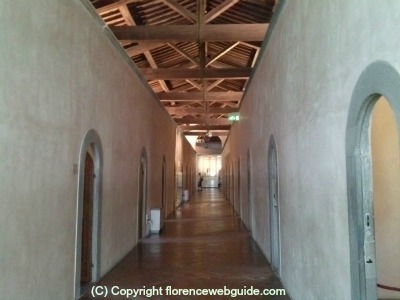 And on the other hand, it is an art gallery home to the largest collection of works by Fra Angelico (1395 - 1455). 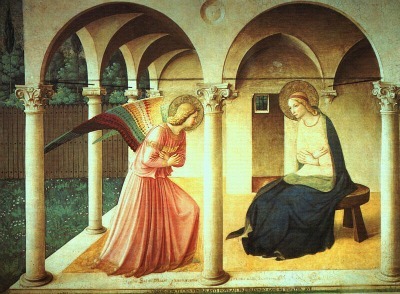 Also known as Beato Angelico, this Tuscan painter is one of the universally acclaimed masters of the Renaissance. 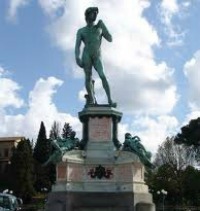 Cosimo de Medici was a wealthy banker with great influence in Florence in the 1400's. 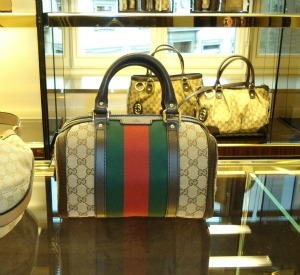 The Medici's had made their fortune through banking, and more specifically, money-lending. While becoming rich is certainly something that would please any man, Cosimo was terribly guilt-ridden. The bible condemned the lending of money to collect interest - money had to be earned through direct labor, not by taking advantage of those who lacked it. In his 'Inferno' money-lenders were relegated to the lower rungs of hell, futilly wringing their hands, representing the idleness and lack of productivity of the money-lender. Pope Eugenius IV found the solution for Cosimo's distress. In order to save his soul he suggested that Cosimo could finance the restructuring of the San Marco Church and Convent which was in very bad shape. And Cosimo did, in a very grand fashion by hiring Michelozzo - his favorite architect - and the friar/painter Fra Angelico to decorate the walls in 1437. So, it was out of this deal of mutual needs, that the San Marco Museum has come down to us today. 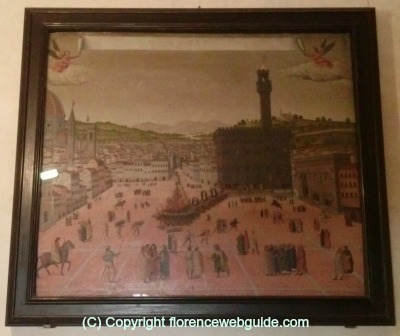 The museum was officially set up in 1869.
walk the halls and rooms where Girolamo Savonarola lived, preached and meditated from 1489 until he was hanged and burnt at the stake in piazza Signoria in 1498. 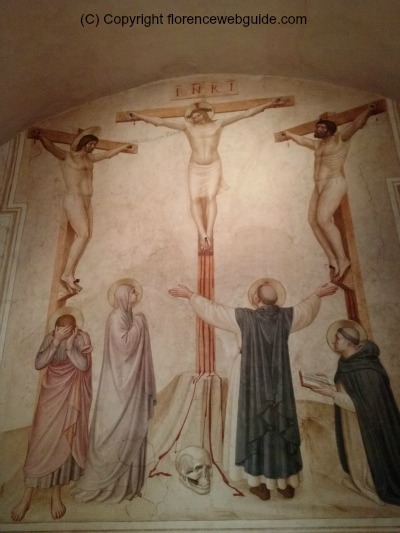 The monk's cells decorated with frescoes by Fra Angelico are the highlight of the San Marco Museum. The word 'fresco' means 'fresh' but also 'cool' and refers to the painting technique where colors are painted directly onto the damp plaster of the wall so that the paints penetrate the material and the image will last. As you walk up the steps to the first floor where the cells are located the first mural you meet at the top of the stairs is Angelico's 'Annunciation', one of the Renaissance's most famous images (see pic below). This fresco - in which the angel Gabriele announces to Mary that she would become the mother of Jesus - is the start of the cycle of frescoes which depict the life of Christ. The scenes from the life of Jesus continue in the cells, each chamber having one painting which tells a different story. What many people don't realize is that these works of art were not meant to simply beautify the monastery. The monks slept, prayed, fasted and meditated in their cells and each fresco was specifically painted to serve as a source of inspiration. These spiritual visions projected on the wall represent the principles and rules dear to the Dominican order such as poverty, humility, and charity. You'll notice that each fresco is placed next to the window, which gave each monk two 'windows' to gaze at: one onto the physical world and one onto the spiritual 'world of Christ'. These works of art are striking for their emotional depth yet their simplicity: the figures are diaphanous and the colors are pastel giving a sense of calm and quiet harmony. 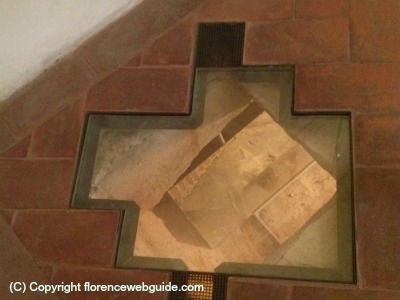 Cosimo too - although not a friar - had a cell built for himself where he could come to meditate and reflect. Being the funder of the monastery, this cell was more 'luxurious' in that it had two rooms (see pic below of first room and stairs leading to 'second floor'). There are three corridors lined with 43 cells in total all on the first floor, each beautifully detailing a different phase in the life of Christ from birth, crucifixion and resurrection. The picture below shows the view from a cell window - the peaceful cloister below. After the friar's dormitories and Beato Angelico's painting, the San Marco museum still has much to offer. 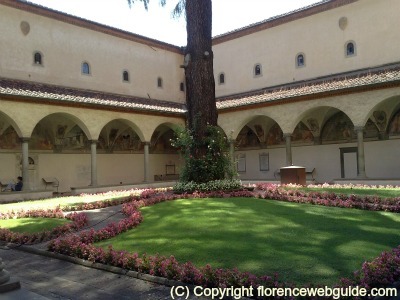 Walking into the San Marco cloister and convent is entering into a peaceful utopia of calm and serenity. The small scale and human dimension of the spaces makes you feel comforted and relaxed. You can't help but notice how this environment affects visitors - nobody talks loud or rushes around, as people tend to just unwind and sit contentedly in the cloister tranquilly taking in the spiritual atmosphere. The museum is in the oldest part of the monastery which has remained relatively unchanged since the 15th century. As you enter you find yourself in the St. Antonino cloister where you can see the fresco St Dominic Worships the Crucifix, considered a Fra Angelico masterpiece. Part of the beauty of this courtyard is the sight of the charming cell windows just above the arches on the first floor. The cloister is painted with 17th century frescoes showing scenes from the life of St. Antonino, prior of the monastery who was canonized in the 16th century. 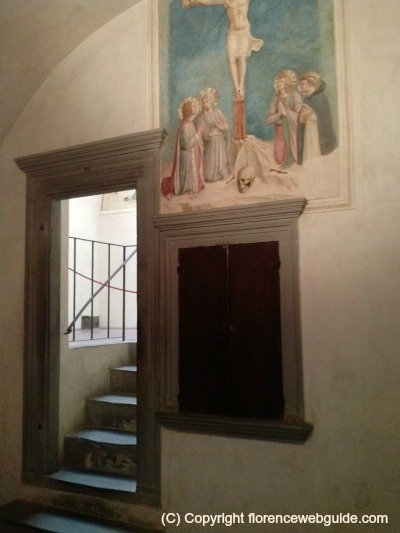 Above each door is a fresco painted by Fra Angelico in the 1400's, such as the one in the picture below (notice the Medici coat-of-arms above the door, in honor of Cosimo's patronage). Surrounding the cloister are a series of rooms where the monks used to carry out their day-to-day activity: the refectory, the hospice, the washing room, and so on. Each room hosts Renaissance painting by a different artist. There is a very large collection of panel paintings by Fra Angelico as well as displays of Fra Bartolomeo's work - a conteporary of Savonarola and the artist who painted the most famous portrait of the fiery preacher. 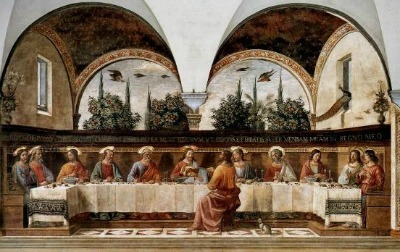 The small refectory - which is where the book shop is located today - is home to the work by Domenico Ghirlandaio, the Last Supper, dated 1480. The library in San Marco was the first to be opened to the public in the Renaissance. An imposing room with double columns and cross vaulted ceilings, this is where ancient Greek and Latin manuscripts bought by the Medici were kept. This location is historically significant in that this is where the humanists Lorenzo the Magnificent, Pico della Mirandola and Agnolo Poliziano met up to study and discuss the philosophical ideas which so characterized Florence from 1450 - 1500. Today the library holds 15th century liturgical books illuminated with gold gilding and hand painted by the friars. A small section shows how this meticulous work was done. The San Marco church and convent were built over a former monastery set up by the Silvestrini in the 1200's. Excavations into the structure of the building have turned up paintings that go back to Medieval times. Some of the cells allow you to see these findings first hand. Some bricks have been removed and a glass panel lets you see down into the sub-structure where the paintings are located. The Dominican friars had a very good reputation for their ability to prepare herbal remedies and natural medicines. Much like the world-famous Pharmacy of Santa Maria Novella which is still functioning in Florence today, also the Convent of San Marco used to have its pharmacy. 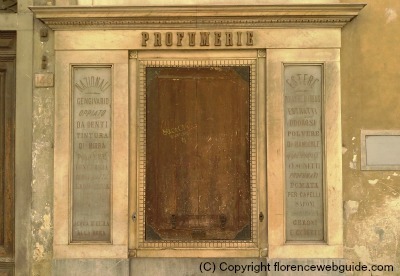 Opened in 1450, the pharmacy remained active until 1995 and its nostalgic store-front is still visible today. Along the left side of the church, in via Cavour, if you go up the block you can see where the friars used to sell their products in the back section of the convent. The chiseled marble signs still show us what was on offer: soaps, tonics, essences, hair lotions, talc powders, and so on. 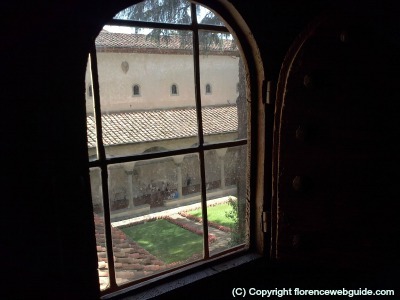 This is an interesting glimpse into the history of the monastery and is often not even noticed by passers-by or visitors to the San Marco museum. 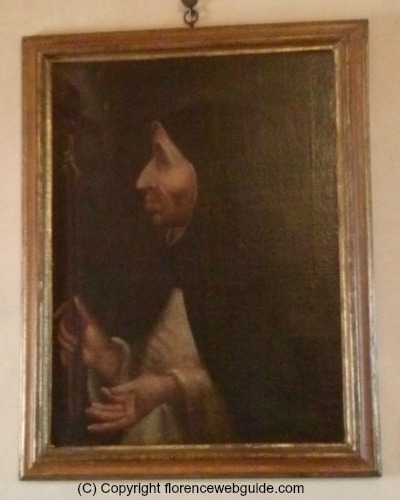 Fra Girolamo Savonarola was the most influential man who lived in the Convent of San Marco. Savonarola was a rousing Dominican preacher who had a great following in Florence from about 1490 til his death in 1498. Uncompromising and severe, he preached against what he called 'vanities', like expensive clothes, jewels, non-religious artwork, cosmetics and so on. Savonarola managed to convince many Florentine citizens - including big names such as Botticelli - to give up their luxuries and organized the 'Bonfire of the Vanities', a huge fire burning these items in Piazza Signoria. Condemned by the Pope for heresy (Savonarola had accused the church of being corrupt), he was put to death. 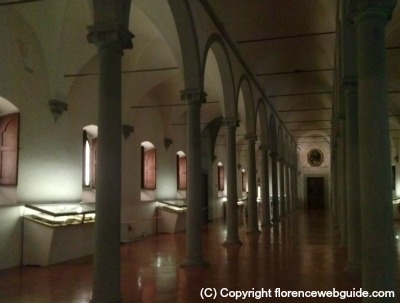 The cells where Savonarola lived and worked are another main sight at the San Marco museum. Revered as a martyr, many of his followers collected and hid the preacher's personal belongings (which it had become illegal to keep). Eventually several of these relics came back to their original home and can be seen today in this part of the convent. 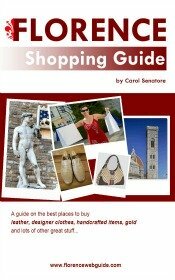 Examples include Savonarola's cloak and a part of the wooden beam that the preacher was hanged from. 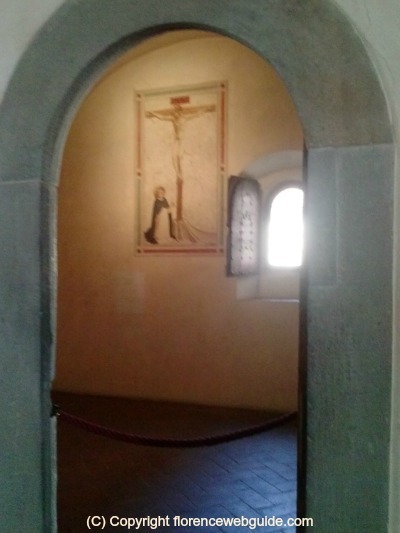 This section is a small Savonarola museum with paintings, coins and statues all inspired by the martyred friar. Picture below shows the most well-known painting of Savonarola being burnt at the stake. 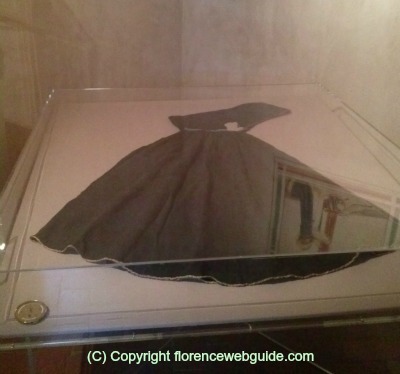 Below is the black cloak of Savonarola. 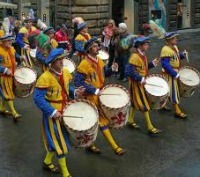 The San Marco museum has a special atmosphere and elegant graceful Renaissance architecture that are worth experiencing. It is a meditative stroll into the past in a charming quieting place decorated with soulful and moving frescoes by one of the Renaissance greats, Fra Angelico. 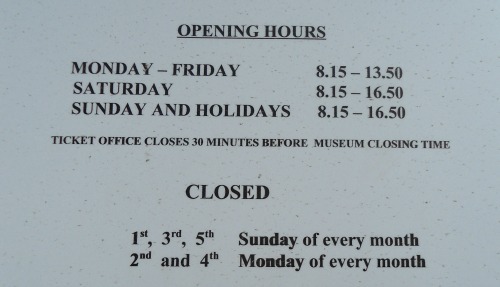 The museum can be seen in about 2 hours, but you will likely want to linger longer. 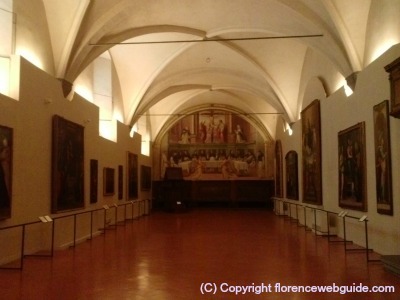 the San Marco Museum can be seen free with a Florence Card!